Quick! Who was the last person executed in the Tower of London? Tick. Tick. Tick. The clock timer is counting down. It's a trivia question and one that few people answer correctly. Some might remember Anne Boleyn from the time of the Tudors. Others might think of Catherine Howard. Few would think that the last execution took place in the 20th century, a mere 74 years ago. While that question pops up on many online trivia sites, it recently achieved a new level of notoriety when it appeared, in modified form, on the famous game show Jeopardy. 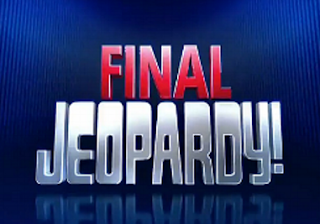 On May 8, 2015, three contestants worked their way through a series of Jeopardy clues. The trick with Jeopardy is that the correct "answer" to each clue has to be phrased as a question. For example: "This man is the host of Jeopardy" would be the clue. The answer would be "Who is Alex Trebek?" The contestants earn money with each correct answer and by the end of the Double Jeopardy session on May 8, each had built up a significant pot of money. Andrew Haringer, a history instructor from Squamish, B.C. had $15,400. Mary Green, an instructor from Milton, GA had $10,000 and Louis Virtel, a web writer from Lemont, IL, was in the lead with a pot of $16,000. It was now time for Final Jeopardy. The host of the show revealed the category, Historic Sites. Each contestant now had a change to write down their wager, without knowing the question. Would they bet the bank or would they play it safe? If they answered the question correctly, their wager amount would be added to their pot. If they answered incorrectly, their wager amount would be deducted from their pot. The clock started ticking. The contestants had 30 seconds to write the answer down on an electronic screen. The tension mounted. Andrew wrote his answer down quickly. Mary and Louis both hesitated. Their time was up. Their answers were revealed starting with the person with the lowest pot of money. Mary's answer was "the Ba" - clearly not correct. She may have been trying to write the Bastille. Mary had wagered $9500 and was left with $500. Sorry, Mary. Andrew's answer was "What is the Tower of London". Ding ding ding! Correct. He had wagered his entire piggy bank, all $15,400 and was now up to $30,800. But would it be enough to win? If Louis had wagered $14,801 AND correctly answered the question, Andrew would lose. Louis' answer was "Auschwicz". Nope. Wrong answer. Louis had wagered $14,801 and lost it all. He was now at $1199. Kudos to Andrew for correctly answering the question. Clearly he paid attention in history class or he's been reading trivia websites. Fickle Fame website - Provides recaps of all Jeopardy shows. The Final Wager website - Analyzes the wagers of Jeopardy contestants.